Obama In Tucson To Call For Unity But What Else? : It's All Politics Besides calling for unity, Obama can be expected to eulogize the dead and praise the heroes. But will he say anything about mental illness? And how much can he say? 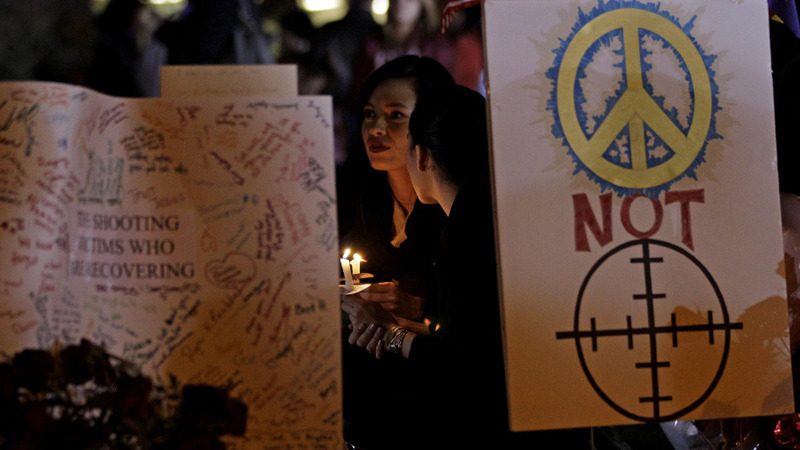 A vigil outside the University Medical Center - Arizona in Tucson, Tuesday, Jan. 11, 2011. A lot of pundits are opining on what President Obama should say at Tucson's Wednesday evening memorial and show of support for the victims of last weekend's shooting and a coming together for the community and the nation. Given that as a candidate Obama successfully pulled off one of the most difficult rhetorical assignments in U.S. history with his March 2008 Philadelphia speech about racial anger and distrust in America, he likely doesn't need much advice. "President Obama has said he wants to speak to our hopes for the future, and how out of this tragedy we can come together as a stronger nation." As the title of David Remnick's biography of Obama puts it, the president has often in his life played the role of "bridge," a conciliating link between white and blacks or the political right and left. But I think the president can use this as an occasion to talk about the general tone of civil discourse in this country. He doesn`t have to say there`s a cause and effect, but he can say naturally our thoughts turn this way. This then I think leads to one of his classic strengths as the title of Dave Remnick`s book "The Bridge" illustrates is he has been known as a person who can find a way to reconcile. Obama's speech will also likely be in part a eulogy for those who were killed and a call for "us the living" as Lincoln put it in, to dedicate ourselves to improving the life of the nation. And he can be counted on to talk about the heroes, as he already has, who ran towards the gunfire to tend to the fallen and subdue the gunman. So if I was President Obama I think the first thing obviously has to do is register the shock that when you have a normal event, a politician at a supermarket greeting voters, when the horror erupts he has to register that shock. Secondly, he has to celebrate public service and people go out in crowds and take tough positions and harbor the literal and metaphorical slings and arrows. But I think finally, if there is a political ramification, I think we need to have a conversation on how we treat people who are suffering from mental illness, 99 percent of them not violent at all, people under treatment not violent at all. But there`s a small, small minority who sometimes become violent. And do we need to get more aggressive in giving them sometimes involuntary treatment, making sure they stay on medications? I think if there`s a political ramification, which I`m not sure there is, that`s the kind of conversation we need to have. It would be interesting if Obama gets into the apparent mental illness aspect of the tragedy. For one, the president has to tread carefully since there's more speculation than fact about what exactly was going on inside the head of the alleged gunman, the 22 year old Jared Loughner. But there is a real problem in the U.S. in the provision of mental health care, especially for the small fraction of the mentally ill whose psychoses make them dangerous to themselves and others. So Wednesday night could be an opportunity for the president to at least raise the idea if only broadly that the nation needs to re-examine how it deals with, or more accurately, doesn't deal with the problems of the mentally ill.
Also, Loughner hasn't even been indicted yet. So the president likely has to be careful about what he says and how he says it in order so as not to impact Loughner's ability to get a fair trial or, on the other hand, the chances of the prosecution to get a conviction. Thus, it will be interesting to see what, if anything the president says about the role of mental illness in the shootings or the nation's need to improve how it cares for the mentally ill.